In this digital age, there is technology for almost everything, and many app developers are turning their attention towards truck drivers. Fleets and independent drivers rely heavily on smartphones and tablets to communicate and move their loads efficiently. In a recent survey, it was discovered that over half of truck drivers use their phones for business purposes such as booking loads, bidding on loads, and other things like monitoring weather and gas prices. This survey further revealed that many drivers would give up their CB radios and happily replace them with mobile apps that did a better job of improving not only their job but the lifestyle that comes with being on the road so long. Because there’s so much you can do and gain with the use of mobile apps; we put together a list of our favorites that can help truck drivers and fleet owners. One of the most significant issues truck drivers face when they are on the road is managing their time. For most drivers, getting caught up in weight stations can set you back. The app Drivewyze is designed to help truckers bypass these stations, so you can keep moving. Information is provided for 36 states and over 600 inspection sites. It requires a paid subscription, but the payoff is the ability to improve your CSA score. We had to put this at the top of the list because it is probably the best app available for truckers and their families. Skype provides users with the ability to communicate long-distances without racking up a massive phone bill. You can send instant messages, voice, or video call. The app is available on every device and works on both wifi and cellular data. Pro tip: if you have a restricted data plan, make sure you are connected to wifi before you make your calls. The app can eat into your data reasonably quickly. Truckers burn hundreds of gallons of fuel each month, and for those who are contracted, this can become costly. The free app GasBuddy is a community of users who provide each other with information on the lowest diesel prices across the country. You can search the app for the cheapest available and what is located nearby. Additionally, you can weed through the information to find out if this station has features that you might need before you make a stop. The app CoPilot Truck is designed to help users by delivering distraction free navigation. There are 2D and 3D maps available with lane indicator arrows that provide clear directions, especially for complex intersections. It also can help you find the best routes for multi-stop trips and calculate efficient routes based on the load type and vehicle profile. The app follows industry standard PC*Miller routes so you can worry less about complying with regulations and being slapped with a fine. If this didn’t sound good enough already, you could use their high-quality maps offline so you can save on your data. TruckLogics is an app to help run the business of driving your truck. It provides you with a place to store all of your documents and export reports. They have features that allow drivers to capture any and every expense so they can continue to focus on running their business. Additionally, the app will enable you to send invoices, dispatches, and keep up with your truck’s maintenance schedule. For fleets, this app allows for internal communication and is an excellent resource for keeping drivers up-to-date on routes, manage your payroll, and share trip documents. This app was built for truckers to help other truckers. It’s a comprehensive list of everything that might make it that much easier to complete your route efficiently and on schedule. When using Trucker Path, you can find the truck stops that have showers, rest areas, view nearby weather, and read reviews of truck stops from fellow drivers. It also will tell you which weight stations are opened or closed, give you real-time parking availability, find fuel stations with diesel, and let you pre-plan your trip with their GPS. 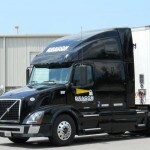 Want to become a truck driver? Visit our website to learn more about a career at Beacon Transport.